I'm more of a glamper than an actual camper, but when I spotted China Glaze's Happy Campers Micro Mini Set, I couldn't get over just how well it captured the essence of fall / sweater weather, and had to pop it in my basket. No regrets, ladies! You will love the range of autumn-inspired hues and finishes in this collection. Trust. 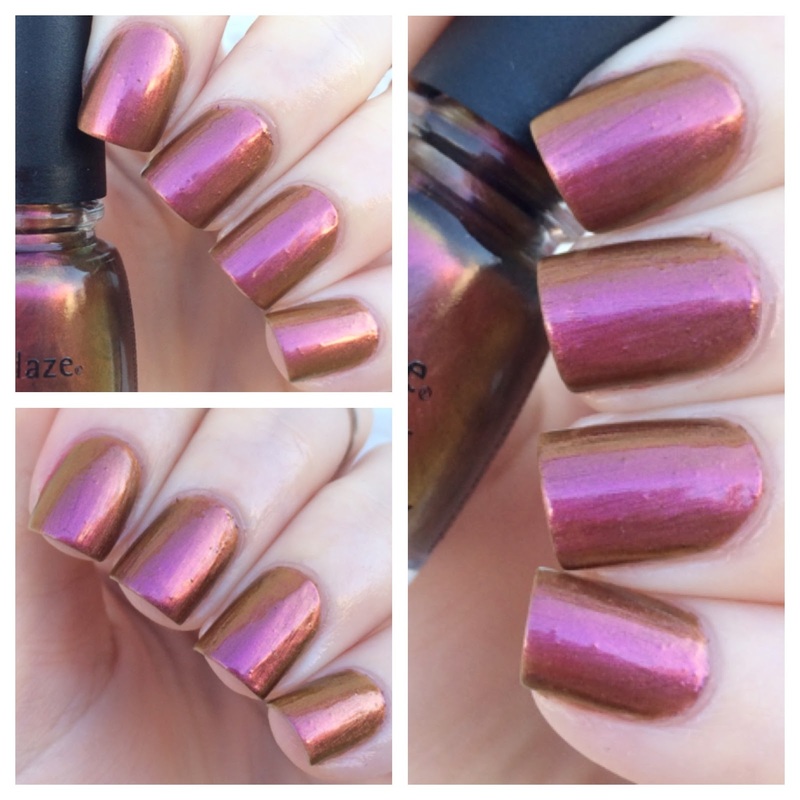 Cabin Fever is a Cranberry Duochrome with a Bronze , Copper, and Pink Color Shift. Dead. This color right here is life. Cabin Fever reminds me so much of a scarab beetle - it has that same gorgeous shift that you simply cannot stop staring at. The formula was amaze here. I found it to reach opacity v. quickly, and wasn't brushstroke-y. This is 2 coats. Sleeping Under The Stars is an Indigo Creme with Pink/Lilac Microshimmer. So, in the bottle the microshimmer is crazy visible, almost leading you to believe that Sleeping Under The Stars has a duochrome shift like Cabin Fever; but, alas, it doesn't. Truth be told, the shimmer is so hidden, that you can barely see it on the nail - even when you're standing in direct sunlight. Womp womp. I wasn't crazy about the formula here. Though it was opaque in one coat, the formula was v. thick and resulted in staining. This is 1 coat. My Lodge Or Yours? is a Dusty Mauve Rose Creme. This one right here managed to make my Top 3 list from this collection - it just feels like the perfect shade to pair with sweaters, scarves, and boots come fall. The formula was fab on this one - very rich, gummy, and opaque right from the first coat. This is 2 coats. Wood You Wanna? is a Taupe Brown Metallic Shimmer. Yaaasss! I'm not usually one for metallic shimmers but this one is straight. up. lush. Not to mention ridiculously unique. I mean, when else have you seen a taupe brown metallic with red undertones. It's virtually unheard of - yet so perfect. The formula was a total breeze with this one. Wood You Wanna? is the surprise standout shade of this collection. This is 2 coats. Change Your Altitude is a Gray Putty Creme. A few years ago, when gray cremes were hard to find, Change Your Altitude would have likely been my favorite shade from this collection; but now that gray cremes are so commonplace, this one falls into my ho-hum pile. Pretty, but nothing exciting. The formula was good here. I found it to be a little thin, but it did reach opacity with little effort, and was a nice density. This is 2 coats. Free Bear Hugs is a Chocolate Oxblood Creme. You guys, I am so upset because Free Bear Hugs was my main motivation for purchasing this collection, and it was a total letdown color-wise. I was expecting a rich, melted chocolate brown creme with oxblood undertones, and this definitely didn't deliver that; rather, it looks like your ordinary, run-of-the-mill merlot. I'm not sure if I got a bad bottle or something, but it definitely wasn't what I was seeking. Not to mention that the formula was thin - I definitely could have gone with another coat. This is 2 coats. PRICE: $15.00 for the 6-Piece Mini Kit; or $7.50 per full-size bottle. Such fun names! Love the fall colors too! The grey shade is so stunning! !